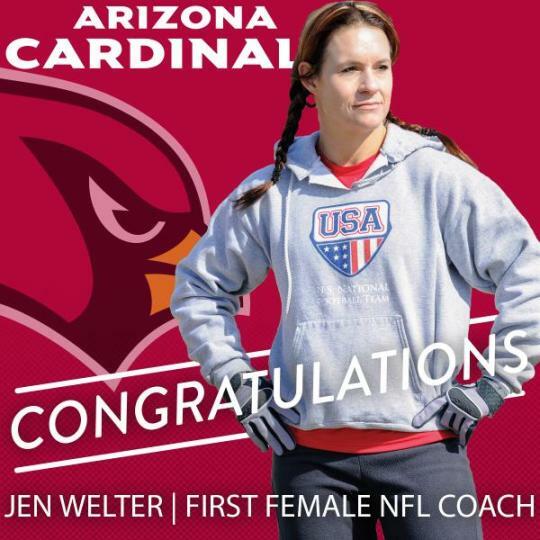 Remember last year when I did a blog about Jen Welter and girls who play football? No? Click here. Well, Welter has officially moved on from playing professionally to coaching professionally. The former running back for the Indoor Football League’s Texas Revolution is now a coach with the National Football League’s Arizona Cardinals. Yep, you read that right…the N. F. L. This hire and announcement make her the first female coach in the history of the NFL. Lest you think that Welter has appeared overnight, check out her pretty extensive resume. In her 37 years on this earth, Welter has managed to play rugby at NCAA Division-I Boston College, play 14 seasons of women’s professional football, snag a master’s in sports psychology and a Ph.D. in psychology, win two gold medals with Team USA in the International Federation of American Football Women’s World Championships, become the first female to play a non-kicking position in a professional football league, and coach linebackers in two different men’s professional football leagues. Whew! I got tired just writing all of that! Needless to say, this woman is quite accomplished and well deserving of the opportunity to display her skills at the highest level of play. Try to keep an eye out for Welter as she works alongside some of the best in the NFL as a training camp/preseason intern with the inside linebackers.